Landa returns to Sioux Falls to defend his first ever Pro title. Hello racquetball fans! This coming weekend is what has now become the 2nd biggest International Racquetball Tour event of the season and is the reported longest running Pro event in the land; the Lewis Drug Pro-Am held in Sioux Falls, SD. Thanks to the long-standing generosity of the sponsors, this event generally features the richest and best draws outside of the US Open. r2sports.com home page for the event is here. Quick note: keep IRT CEO John Scott in your thoughts; he underwent some emergency surgical procedures in the past couple of weeks and is recuperating at home. This year, the event falls right on the same weekend as the massive annual Longhorn Open, which has a WRT event that unfortunately drew away a few of the names that may have considered entering. Nonetheless, there’s a solid draw of 39 pros entered into Lewis. Ranking implications of this event: after months of kvetching about the IRT ranking system and the implications of Kane’s four missed events in the spring of 2017-18 season, this event likely rectifies the situation. This is the first event from last spring that Kane missed, meaning he has zero points to “defend” from the Lewis Drug event last season. Therefore, he has no where to go but up. Meanwhile, current #1 Landa won this event last year and therefore has 400 points to defend. If Kane wins … irrespective of who makes the final Kane should ascend back to #1 ranking. He will have gained more points than either of the two guys ahead of him could earn. The only top 20 pros missing are #6 Sebastian Franco (on his Honeymoon as per IRT press release) and #10 Bobby David Horn, who was ill at the California Open, has been fighting through some injuries all season and seems to be taking off the weekend to recuperate for the busy spring schedule. These two absences give Jose Diaz his first ever top 8 seeding, which immediately gets “switched” to a #7 seed for the tourney. Canada’s top players too, including Tim Landeryou, Lee Connell and Tanner Prentice. – #21 Sebastian Fernandez goes up against fellow 18U recent graduate and current US Junior National champ Ricardo Ricky Diaz. Tough draw for Diaz, who runs into a guy who has been really making waves on tour so far this season. – #20 Mauro Daniel Rojas vs Christian Longoria; a great first round match between contrasting styles; the shot-making control game of Longoria versus Rojas’ power. – #13 Adam Manilla vs Timmy Hansen; Manilla plays the youngster Timmy Hansen, who enters a pro tourney for the first time. Hansen is the reigning US 14U national champ and makes up one half of a potentially pretty darn good Father/Son team with his dad Tim Hansen (one of the most decorated amateur players of all time and USAR hall-of-fame inductee). – #19 Nick Riffel vs Lee Connell: Connell has been playing Canadian National events since Riffel was in grade school; we’ll see if the veteran can handle the newbie. – #11 Jake Bredenbeck vs Cesar Castillo; Castillo enters a pro tournament for the first time since 2015; he’s a long-time international representative of Venezuela, last playing for his country in the 2017 Bolivarian games. – #10 Jansen Allen gets a tough 1st round draw in Sioux Falls native John Goth. Goth only has a few major tourneys on his resume over the past few years … but rolled to the US National final in 2012 and has taken out touring pros like Sebastian Franco and Christian Longoria in recent WRT events. This could be a tough one for IRT regular Allen. – #15 Felipe Camacho matches up against Matthew Ivar Majxner, a tough player who has been playing pro events since the late 1990s. – #18 Gerardo Franco Gonzalez faces the always-tough Alejandro Herrera, last seen taking the Men’s Open draw in Minneapolis and who played Robbie Collins tough in the pro draw in Minneapolis before losing. Herrera plays with pace, and Franco will need to adjust. – Montoya over Robert Collins; tough draw for Collins, who has had a solid season, but I see a Montoya win here. – #9 Mario Mercado vs Tony Carson: missing out on the bye comes back to haunt Mercado, who runs into former touring pro Carson, who has the wherewithall to advance here. I see a Carson win and Mercado’s tough season continuing. – Charlie Pratt versus Sebastian Fernandez: wow, tough match up here. Pratt has experience on his side but these two play a very similar game; all about control. I give the cerebral Pratt the advantage here over the youngster. – Manilla vs Rojas: I like Rojas here, out-pacing the lefty Manilla in what should be a shoot out of power players swinging out of their shoes. – Carter vs Riffel: these two buddies have met three times on tour, with Riffel taking two of them. I think Riffel wins again and advances to the main draw. 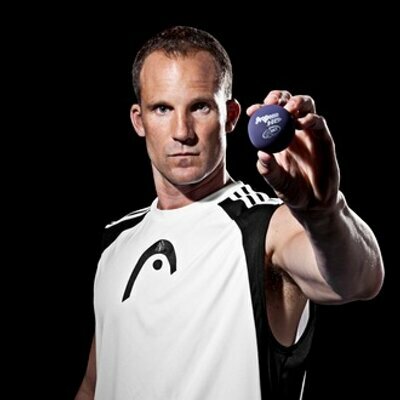 – Allen vs Landeryou: I like this match-up; i think this could be a pretty tight game. I like Allen’s game lately; he has not been an easy out, but Landeryou’s game could frustrate. – Franco over Camacho: assuming we don’t see a surprise upset, I like Gerardo Franco in this match. He’s got the game and has the capabilities to do a break through. Main Draw: round of 16. – #1 Landa vs #16 Montoya: for the 2nd straight event, and for the third time in two months, we get Landa v Montoya. Last time, I predicted the upset, and instead Landa cruised to the semis. This time … i’m predicting Landa returns to the site of his first ever pro victory energized and takes a 2 game win. A semis-quality match-up in the 16s yet again. – #8 Alvaro Beltran v Tony Carson: Carson has beaten DLR and Parrilla the last two IRT events he’s entered; he can beat Beltran. But … they’ve met 6 times on the IRT and Beltran has won all 6. I’ll go with a tiebreaker win for Alvaro Beltran. – #5 Samuel Murray v #12 Pratt: last time they played was at the 2018 Worlds, where Pratt waxed Murray in two. Can he repeat the favor? I think he can; since making the final in the season opener, Murray has four early exits in a row in pro events, including two round of 16 upsets. Pratt can make it another early exit here. – #4 Daniel De La Rosa vs Rojas: DLR converts back to Racquetball from Pickleball and downs the youngster Rojas in the 16s for the 2nd tourney in a row. – #3 Kane Waselenchuk gets his first match likely against Riffel and makes quick work of the youngster to advance. – #6 Andree Parrilla vs #11 Jake Bredenbeck: these two have met a few times … and Jake has never lost to Andree. They havn’t met in a year and a half though, and in that time Parrilla has taken a big step ahead. I think Parrilla advances. – #7 Jose Diaz vs #10 Allen: they’ve met 5 times and have gone back and forth; Allen got him in their most recent meeting in Laurel. This is an excellent opportunity for Allen to regain some of his momentum and get back to the quarters. Expect a tough match here. I’m not sure who I favor. I liked what I saw out of Allen in the last event; we’ll go with the Texan here. – #2 Rocky Carson vs Gerardo Franco: they met in Laurel earlier this season and Rocky pasted him. No reason to expect a different result here. – #1 Landa over #8 Beltran: Landa has his number and has had it for a while. 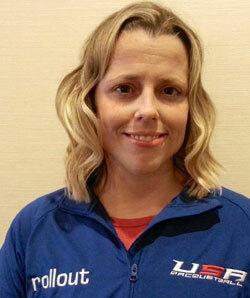 – #4 DLR over #12 Pratt: they met at the US Open, a tight but 2-game win for DLR. I like the way DLR is trending this season … he seems like he’s been much more consistent this season than last. After missing the first event, he’s made two finals and a quarter and is a good bet to make at least the semis here. – #3 Kane over #6 Andree: a rematch of the quarters from California, a 3,5 beat-down. No concrete courts in Sioux Falls, so perhaps Parrilla can keep it close, but expect a 2-game win for the King. – #2 Rocky vs #10 Allen: they’ve played 13 times … and Rocky has won 13 times. Expect 14 for 14 here. – #1 Landa vs #4 DLR: these two met at the Lewis Drug in 2017 semis and in the 2018 finals (an 11-10 Landa win for his first ever pro title)… so its only fitting if they meet again in 2019. Landa has beaten him h2h 3 straight times now, but they’re always battles. Can DLR turn the tide? I’d like to see Kane vs Landa in the final but it wouldn’t surprise me if it was Kane-DLR again. – #3 Kane vs #2 Rocky; they’ve met 76 times (!) … but if they meet here it’ll be the first time they’ve faced off in a match that was NOT a final since 2009. That’s 10 years of match-ups for tourney titles. Nonetheless, Kane makes it 74-3. Finals: Kane over Landa. Or maybe DLR. Or perhaps Montoya if I get my predictions way wrong. There’s also a solid Doubles draw for only the third official IRT doubles event of the year., with 10 teams playing and the regular suspects (Beltran/DLR, Landa/Murray, Montoya/Parrilla). Beltran & DLR are unvanquished in nearly a year of doubles competition and remain the team to beat. 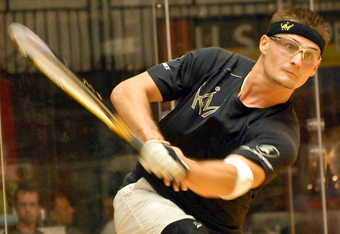 Congrats to Kane Waselenchuk for winning the 2019 International Racquetball Tour California Open. With the win, he captures his 113th career Tier1/Grand Slam event, extends his current match winning streak to 74 matches (3rd longest ever streak), and extends his current game winning streak to 48. He’s yet to drop a game since the tour went to best of 3. With this win, he rises to #3 in the tour rankings; this was the event in which he got injured last season, so from here until May he’s got no points to defend and should pretty quickly rise up the rankings. He’s got 300+ point advantage in season-to-date rankings already and is well positioned to claim another year end title. Proracquetballstats.com Match report for the event is here. Lets review the draw, with comments on notable (to me) results. – In the battle of reigning world Junior champs, the elder 18U champ Eduardo Portillo Rendon outlasted 16U champ Diego Garcia Quispe 12,11. Garcia showed a lot of power, with a sneaky fast serve, but Portillo’s smooth approach kept him just ahead of the Bolivian. – Mexican Junior Oscar Nieto Valadez snuck by the Ref Scott McClellan 11-10. Nieto made the Mexican National 16U final in 2017 … then seems to have missed the 2018 Nationals and Selection events. But he’s still got a year of juniors and looks like a pretty solid player. – Robert Collins took out Sebastian Longoria in 2 straight … which isn’t normally notable except that Longoria is just 16 years old. He lost in the final of the Jr Worlds 14U in Minneapolis in 2017. 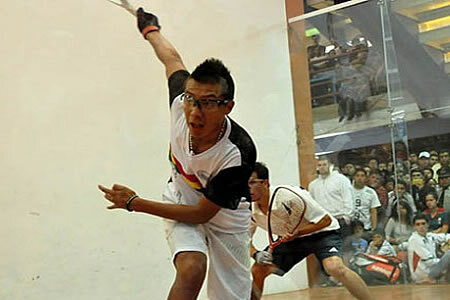 – Nick Riffel outlasted outdoor champ Luis R Avila 11-8 in the breaker, in a close match between two solid players. 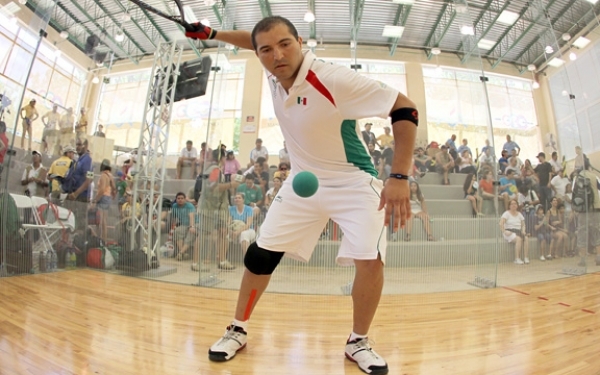 – Rodrigo Montoya Solis cruised past Gerardo Franco Gonzalez 9,6, setting up a match against #1 Alejandro Alex Landa . – Portillo took out #9 seeded David Horn 11,13. This is a pretty significant result for me, demonstrating how far Portillo has come in the past year. Its also another early loss for Horn on the season, who now in four events has lost in the 32s twice and the 16s once. Reports are that Horn was under the weather, contributing to his loss, and he forfeited out of doubles after this result. 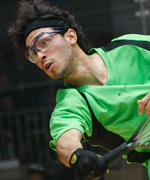 – Sebastian Fernandez took out Adam Manilla 8,12. Also a notable result, in that its another 18-yr old taking out a pretty experienced IRT touring pro. Both Portillo and Fernandez are flexing their muscles on tour right now. – Nieto took Jake Bredenbeck to a tiebreaker before falling 11-3. Not a bad result for a kid playing in his age 18 season. – Mauro Daniel Rojas took out veteran Felipe Camacho 11-6 in a breaker. Very good result for Rojas. – In the 15/18 match-up, Robert Collins earned another match against Rocky with a solid 2-game win over Riffel. – The highly anticipated match between #1 Alejandro Landa and IRF world Champ Montoya, the fans were not disappointed. Landa came out on top after dropping the first and racing away with the second. Landa dominated the tiebreaker, jumping out to a 9-2 lead, then held on for a 11-6 win. These two matched up in the Mexico City Open in Dec and Montoya came out on top; this time it was Landa. – With his greatest ever IRT victory, Portillo downed #8 seeded Samuel Murray 14,14. – Andree Parrilla held off the other 18U champion in the draw Fernandez, holding on for an 11,13 win. – Jose Diaz indeed got the upset of Sebastian Franco in a tie-breaker, continuing his fantastic season. Diaz now has two quarter-final appearances on the new season and is on track to break into the top 8 based on performance. – Alvaro Beltran held off the solid Jansen Allen in a tie-breaker. – Rocky Carson left nothing to chance, giving Collins a donut en route to a 2-game win. – Landa pounded the 18U champ Portillo 3,5, ending his tournament quickly. Still, this is easily Portillo’s best ever IRT event (prior career best was a round of 32 exit at the 2017 US Open). – Waselenchuk made quick work of Parrilla, ironically by the same 3,5 score as Landa’s win. Kane’s serves were just outstanding, Parrilla could do little with his match all night, and to add insult to injury Kane hit splats from down the line positions at 39 feet and rolled out between-the-legs shots. Just unfair. – DLR outlasted Diaz in a back and forth tiebreaker. – Carson got revenge and came from a game down to beat Beltran. – Kane gave #1 Landa a donut before he caught his breath, then outlasted him in the second to advance to the final 0,9. – DLR won a fantastic 11-10 tiebreaker over Rocky Carson, a scintillating match where each player had multiple shots at match point. In the Final, DLR was making shots and was pressing Kane most of the way, but in a common refrain Kane controlled the end game like a chess master, and quickly turned a game that was close up until the 8-8 or 10-10 range into a 15-8 or 15-10 game win. DLR tried some unconventional (to say the least) tactics to try to throw Kane’s service game off, to some success it should be said, and really experimented with his service game, but it was to no avail. A sharp Kane and concrete walls proved to be unstoppable. In the doubles draw, it came down to #1 vs #2. In the end, DLR rebounded from his singles loss to team with Beltran to top #2 seeded Landa/Murray in two straight. These two teams are separating themselves this year, playing together nearly every event and making a name for themselves (along with the Kane/Ben Croft team) as the best in the world. We have a rare break in the schedule; nothing on the books for the weekend of 1/13/19. But the following weekend we have the great annual Lewis Drug Pro-Am in South Dakota and the equally good Longhorn Open in Austin. I’ll publish some content in the interim related to some new reports and bug fixes i’ve been working on.